The European airline industry has seen a surge of bankruptcies in recent times. Three low-cost carriers, including Danish Primera Air, Cypriot based Cobalt Air and SkyWork Airlines filed for bankruptcy over the course of the last month alone. While these airlines were comparably small by industry standards, with combined turnovers of just under €1bn, they are exemplary of the pressures that the industry is confronted with. Referring to the bankruptcies, EasyJet chief executive Johan Lundgren said that “We are going to see more failures”. The issues pressuring the industry are numerous and have been amplified by fierce competition and rising costs. Based on industry averages, jet fuel accounts for 30% of carriers’ costs. With prices reaching a historical low in January 2016, at $0.93 per gallon, airlines were able to minimize their costs while boosting their profits. However, fuel prices have more than doubled since then, to currently $2.19 per gallon. Adding to this, fuel is traded in Dollars, which means that European carriers have sustained further losses as a result of the weak Euro, being able to acquire less and less fuel for the same nominal expenditure. Low cost operators are stumbling in particular under these increased fuel costs as they have little room to accommodate volatile trends, partly due to a lack of liquidity. Compared to other industries, airlines have one of the lowest working capital (current) ratios, at an industry average of 0.57. Although this is an industry norm and allows for continued operations, it demonstrates that carriers are at much higher risk of collapsing when their costs increase. Similarly, labor costs account for up to 25% of carriers’ costs. 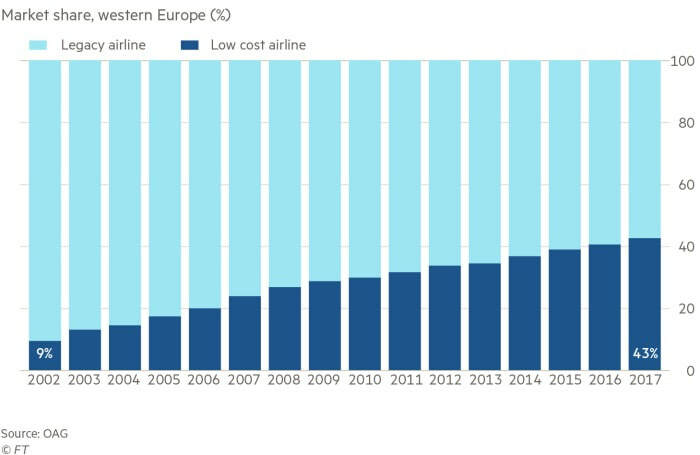 With union power strong throughout Europe and cabin crews as well as pilots demanding higher wages, this has significantly increased the operating costs of airlines. Ryanair saw a 20% increase in pilot pay along with a 30% overall increase in staffing costs. Combined with numerous strikes, Europe’s largest airline had its profits fall by 7%, while its shares saw a significant 18.4% slump since the beginning of the year. It is therefore not only smaller low-cost carriers that are struggling, but even the well-established giants Ryanair and EasyJet are facing notable hurdles. These hurdles are now being exacerbated by the uncertainties surrounding Brexit. Both from an operational, financial and investor perspective, future performance could be heavily impacted by Britain’s withdrawal, even more so should it come to a ‘hard-Brexit’. Non-European shareholders of Ryanair could for instance lose their voting rights while day to day operations of carriers will certainly be complicated by additional restrictions and increased bureaucracy on important UK-Europe connections. While both EasyJet and Ryanair are nowhere close to the risk of bankruptcy, other low-cost carriers are not so fortunate. The Icelandic WOW air, recording a negative EBIT of $13.5 million last year, is expected to double its loss this year. With numerous routes cancelled, the airline is now considering an IPO worth up to $300 million in the near future, to ensure prolonged access to equity. Norwegian has also reported financial difficulties and warned of the consequences of higher costs. The European low-cost airline industry is clearly under significant pressure and future bankruptcies do not seem all too distant. Yet, it is not only lost cost operators who are struggling. Legacy carriers have also seen their costs increase and it has been rumored that the financially ailing Etihad might see a takeover by rival Emirates. Nevertheless, with consumers seeking cheaper and cheaper travel, low cost operators will surely not see their demand fade and will eventually overcome the issues that the current market situation poses.